England kept an iron grip on their World Cup group as they beat Ukraine 4-0 in Shrewsbury to make it six wins from six qualifiers. After a frustrating first 40 minutes, Natasha Dowie's precise header gave the hosts a narrow half-time lead. 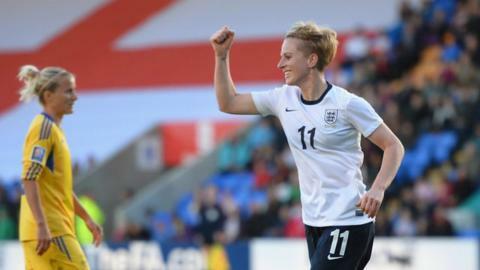 England stretched clear after the break with the lively Eniola Aluko finishing from close range before Dowie steered in a third four minutes later. A fine finish from Aluko rounded off a comfortable evening's work. The result, combined with closest challengers Wales's 4-0 win over Montenegro earlier in the day, means manager Mark Sampson's side remain five points clear at the top of Group Six, and are on course to reach the 2015 finals in Canada. Ukraine were unbeaten in Group Six coming into the game - winning away against Montenegro and Turkey before taking a 1-1 draw from a visit to Wales in April - and their sturdy defending kept Sampson's side out for the first 40 minutes. Chelsea striker Aluko, whose younger brother Sone plays for Hull, prodded a shot into goalkeeper Iryna Zvarich's shins before testing the goalkeeper more rigorously with a fierce effort shortly after. Aluko could not make the breakthrough herself, but it was her cross that set up Dowie for the opener. The Liverpool striker's intelligent movement bought a yard of space ahead of Iryna Vasylyuk and a glancing touch guided Aluko's delivery into the far corner. "In the first half it took England some time to get used to the formation they were playing, but they grew into the game and the passing became more fluid. The strikers were spinning into space well and I think that Mark Sampson will ultimately be happy with what he has seen tonight after a difficult first half." The first half had been hard going for England, but two goals in the first eight minutes after the break, both from well-worked set-pieces, put the game beyond a conservative Ukraine. First Aluko stabbed in Stephanie Houghton's cushioned lay-off before Dowie turned home the Manchester City midfielder's header back into the six-yard box. As a tiring Ukraine side attempted to push forward, Aluko exploited the space they left behind, scoring her 11th goal in 15 internationals with a clever finish. As Zvarich raced out to try to beat her to Jade Moore's through ball, the 27-year-old touched the ball one side of the goalkeeper, skirted round the other and slotted into the unguarded goal from a tight angle. Ukraine's best chance came with just three minutes remaining, but Siobhan Chamberlain plunged to her left to push away Daryna Apanaschenko's effort. England manager Mark Sampson: "I thought in the first half they set themselves up well, making it hard for us to break them down. "We have some tough away games now which will be a different challenge for us, but we are where we want to be and we showed tonight that we have strength in depth."